» Brad Pitt’s World War Z vs. Johnny Depp’s Lone Ranger: Which Hollywood Blockbuster Is More Entertainingly Screwed? Brad Pitt’s World War Z vs. Johnny Depp’s Lone Ranger: Which Hollywood Blockbuster Is More Entertainingly Screwed? This week, The Hollywood Reporter brings word of two massive, star-studded Hollywood productions experiencing some, um, technical difficulties. 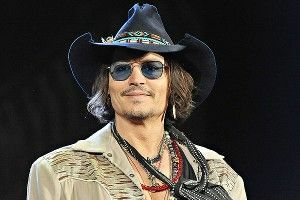 One of the pair, The Lone Ranger, is no surprise: The re-teaming of Pirates of the Caribbean power duo Johnny Depp and director Gore Verbinski has already been grounded once, when its budget escalated beyond $250 million. Eventually (and surprisingly) the project got back on its feet by slashing its budget all the way down to $215 million — but, now, amazingly, costs have crept right back up to the original mark. Meanwhile, World War Z — an adaptation of Max Brooks’s postapocalyptic zombie novels whose star/producer Brad Pitt was hoping would be utilized as a “Trojan horse for [depicting] sociopolitical problems” — has been unmoored. Apparently Pitt’s handpicked director, Marc Forster, a novice in the effects department, has not been able to dictate his vision to his crew; meanwhile, a string of expensive effects experts hired to work for Forster and save him from exactly this kind of situation have not panned out. Right now the movie is over budget, at $170 million, and in need of expensive reshoots to save the third act. (Screenwriter Damon Lindelof, coming off a big W with Prometheus, has been brought in to punch up the ending.) Says an anonymous insider of the World War Z footage currently on hand: “It’s a great first 45 minutes, maybe even an hour.” And he means that in a positive way!